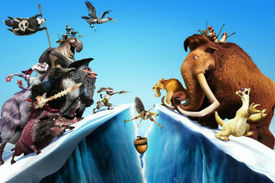 Though wretchedly bad, Ice Age: Dawn of the Dinosaurs was a smash, grossing $886.6 million around the globe. In some countries, it was the highest-grossing film since Titanic, while in other territories it became the highest-grossing animated film to date. Quality evidently not being a concern, Ice Age: Continental Drift is nonetheless a slight improvement over its predecessor. Manny the mammoth (the ever-phlegmatic Ray Romano) is having family problems with rebellious daughter Peaches (Keke Palmer), who in her teenage years is hanging out with the cool kids despite dad's disapproval. In his ongoing quest for an ever-elusive acorn, Scrat the squirrel (Chris Wedge) sets the earth's core in motion, prompting the breakup of Pangea into continents. Manny and family are separated and must reunite despite the interference of ruthless pirates led by gorilla Captain Gutt (Peter Dinklage). Pro forma down the line, Ice Age: Continental Drift is at least less patience-testing than its predecessor. With $198 million already in the bank prior to American release, overwhelming profits are all but assured. The usual cast—Manny and wife Ellie (Queen Latifah), Peaches, saber tooth tiger Diego (Denis Leary), and deeply irritating slug Sid (John Leguizamo)—are reunited at the beginning and joined by Sid's feisty Granny (Wanda Sykes), a seemingly senile and grumpy gastropod. When the earth shifts, Manny, Diego, Sid and Granny are washed out to sea on an iceberg while Ellie, Peaches and the herd trek to a land bridge. A cross-current can get Manny and company back to their friends, but first they must fend off Gutt and his motley crew. Introducing himself in song as a "primate pirate pioneer," Gutt brandishs his ugly yellow teeth in full closeup. Grossness, as ever, is a major component of this Ice Age saga, which is at its most disgusting when Sid spits out pre-chewed prunes (in 3D!) for Granny's consumption. Family-centric messages are dispensed at a regular clip, focusing on the need for parents to compromise with their spawn ("she's not on lockdown," Ellie chides Manny), the importance of teens listening to their parents (Peaches endangers herself while hanging out with vapid cool mammoths, who think "Loser alert!" is the ultimate burn) and—inevitably—the complacent reminder: "Don't let anyone change who you are." Such earnest commendation of individuality is betrayed by the business-as-usual blend of chaotic chases and largely witless dialogue. (A question asked of Ellie: "When you drink water through your trunk, does it taste like boogers?") Co-directors Steve Martino and Mike Thurmeier (longtime members of production company Blue Sky Entertainment) maintain the usual high standards of animation, rendering fur beautifully and diving through frozen and oceanic landscapes with suitable verve. The series' greatest strength—whimsical anthropomorphized animals—is given a few brief moments to shine (Skrat's too-brief interludes, some memorable sharks and crabs, and a pack of adorable chipmunks), in between such unnecessary grotesques as a close-up of Sid's armpit. Alongside stale homages to Braveheart, Pirates of the Caribbean et al., there's one very odd joke about Granny's invisible pet Precious. Throughout the company's perilous voyage, she keeps throwing food overboard and is chided for wasting resources on an imaginary creature. Precious, though, turns out to be a very real, hungry whale who later comes to their rescue. If this is a riff on Lee Daniels' Precious, it's a very odd one, and—along with some why-not? glosses on The Odyssey (sleep-inducing lotus berries and the siren's call)—a faint sign of a perverse sense of humor lurking beneath the bland surface. Still, the film's entirely outshined by the The Simpsons short Fox has attached as an introduction. The wordless, child-and-adult friendly The Longest Daycare pits Maggie versus the Ayn Rand School for Tots, and includes several vintage sight gags that capture the show at its best. Rating: Rated PG for mild rude humor and action/peril.